1) Distributing school supplies for individual students and teachers, including materials for the classroom, and books for the library in all fourteen communities of the Matsés Native Community. 2) Sponsoring teacher workshops in community schools on strategies to improve bilingual reading and writing skills of indigenous students. 3) Producing a teacher's guide of activities for environmental education instruction in Matsés schools. Adopt an indigenous school! 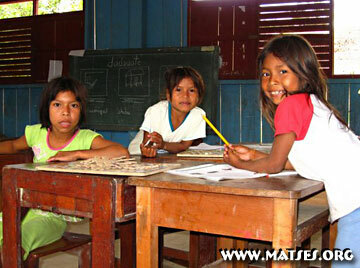 Support the Matsés Movement's Adopt an Indigenous School Program. Education is free for Matsés children, but students need to purchase their own notebooks, pens, pencils and rulers. Buying school supplies represents a severe financial burden for most Matsés as the majority of Matsés families have no source of income.